In the past couple of years there has been a growing trend on the internet for personalization. People have personalized profiles for forums, discussion boards and social networks. This is also reflected in the personalized homepage sector. Many websites offer a widget-based start page that users can customize. This is a growing area of the web, with a lot of competitors vying to be the start page for millions of internet users. Step forward myhomepage, a new contender for your browser homepage. Myhomepage is an online personalized homepage, bookmarking tool and online password manager. It also has some form fill functionality that allows you to log-in automatically to supported websites. It was conceptualized and founded by Max Aengevelt and Massimo Agostinelli who are two young entrepreneurs from Europe. 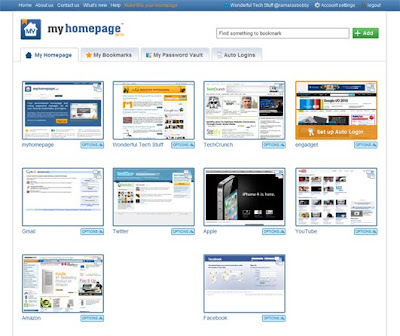 Myhomepage is approaching the personalized homepage from a new angle – by offering lots of different features for users. They are aiming to be the website you have as your browser homepage, however they are different from other competitors because they are not widget-based and they are not a news aggregator. This might be negative to you, but the features it does have might be more beneficial. The first feature of myhomepage you will see is the My Homepage. When you sign-up, you will be presented with a screening offering popular websites for you to add to your homepage. You don’t have to pick any or you can pick all of them. My Homepage is your start page, save all your favorite websites here and then log-in and navigate the internet easily and efficiently. The majority of internet searches are for websites that are frequently visited, such as Yahoo! or Google. This saves users time because they can access bookmarks straight away. Browsers also offer bookmarking, but myhomepage is an online service. This means wherever you go, you will be able to login and find your bookmarks – any time and any place. Bookmarking is at the heart of myhomepage. 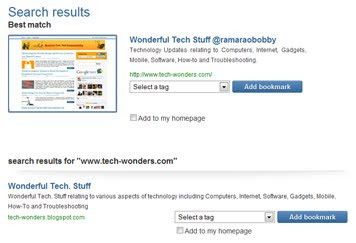 You can bookmark websites in three different ways: through the search bar on the website, through a bookmark button on your browser or by importing them from your browser. It’s really easy to add bookmarks and add them to your My Homepage. You can either do it as you save your bookmark, or on the My Bookmarks tab, right-click the bookmark, select Add to My Homepage and it will be added straight away. Bookmarks are organized by tags. Tagging works really easily, just select or create a tag when you save a bookmark or go back and tag a bookmark after you’ve saved it. Tag it with as many tags as you want, with as many words as you want too. 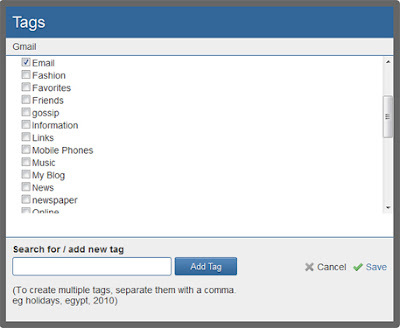 You can quickly find your bookmarks again by selecting the tag from the My Bookmarks tab menu. You can also email your bookmarks to your friends – a great way to share websites. Another feature that is key to myhomepage’s concept is the Password Vault. Users can save password information for every website they have bookmarked. This is beneficial for two reasons. Firstly, you never have to remember a password again; you can easily find it when you log in. Secondly, you can also increase your online safety. The safest passwords to use are often the hardest to remember. But using myhomepage as an online password manager you can use a very difficult password without worrying you’ll forget it. 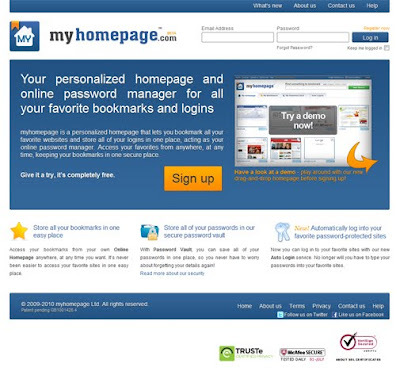 Myhomepage also offers auto login and form fill support for selected websites. This makes it even easier for you to log into your bookmarks. Unfortunately, they don’t yet offer every website and they don’t allow you to select the form and let them process it. You have to let them know which website you would want them to support via email. Customer support is prompt and helpful. In conclusion, it is interesting to see how myhomepage is targeting internet users. The website focuses on helping people organize their online work and life. It has a lot of benefits, the biggest two being it is online and it offers auto login for selected websites. These two features make it stand out from the rest of the crowd because a lot of services in this area work through your browser which unfortunately means you can’t access them from another computer or a different browser. With myhomepage you can access all your bookmarks from work, school or home. The website does have a few areas it could improve. Firstly, more sites for the auto login would be great – perhaps a way to train the system when it comes across new websites with a login form rather than having to email them. It would also be great if there was more customization involved – specifically on the personalized homepage. A great idea would involve more social features – rating public bookmarks, seeing the most popular bookmarks etc. Overall, myhomepage is a very good web service. It will be interesting to see how they develop further and what new features they will implement. You should check it out if you have a hard time organizing your bookmarks and online work. It’s completely free and enjoyable.